Please note: all times listed below are New Zealand local time. While ex-TC Ula fades away to the north of New Zealand, another tropical cyclone has been named in the tropics - Tropical Cyclone Victor (TC Victor). 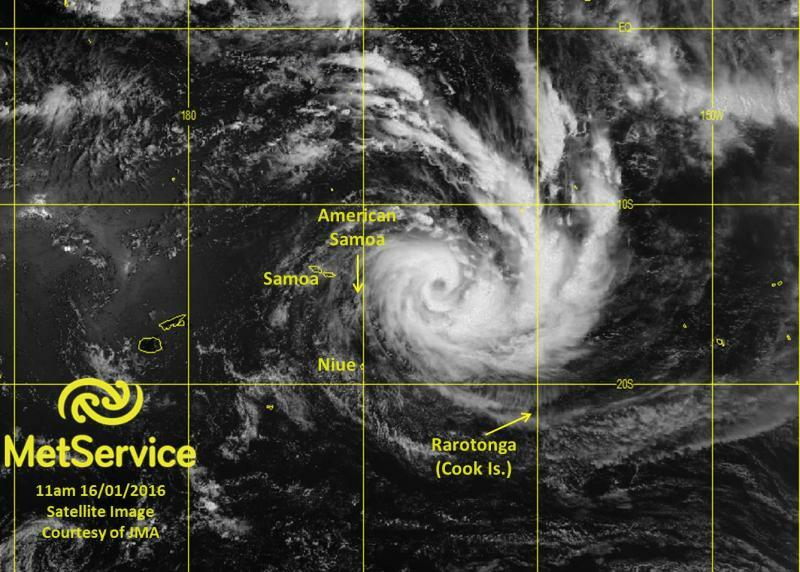 TC Victor was named by RSMC Nadi on January 15th, centred at the co-ordinates 14.7S, 166.3W, about 475 km east of American Samoa. Since then, the cyclone has tracked to the southwest. Historical track of TC Victor to 7am, Saturday 16th January. Image via NOAA Earth System Research Laboratory. 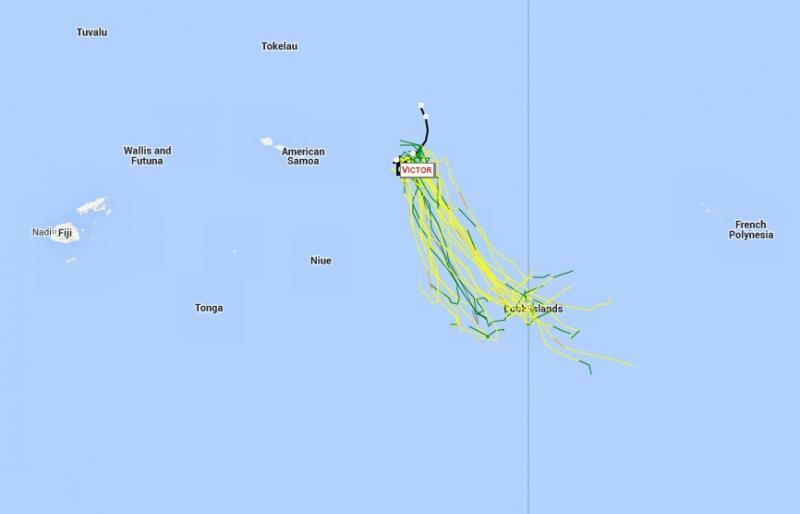 TC Victor was located about 420 km east of American Samoa at 7am today (Saturday 16th January). The central pressure of the cyclone was estimated to be 985 hPa, making it a Category 2 cyclone, and it was moving to the west-southwest at about 9 km/h. Winds close to the centre of the cyclone were expected to be around 95 km/h. Satellite image showing the location of TC Victor at 11am, Saturday 16th January. TC Victor is expected to curve southwards over the next 24 hours and strengthen, affecting the Cook Islands. A gale warning is currently in force for the Northern Cooks, including the islands of Rakahanga, Manihiki, Suwarrow, Nassau and Pukapuka. On Monday, TC Victor is expected to turn towards the southeast, then a general southwards trend is expected over the following few days. However, the forecast track of TC Victor remains quite uncertain beyond this. The map below shows a range of possible tracks out to 5 days time, based on data from the UK Met Office. Here at MetService, we not only forecast the weather for New Zealand, but we also keep an eye on the tropics. You can keep up to date too at our Tropical Cyclone Activity Page, where you can see hourly satellite imagery of the tropics, read the latest Tropical Cyclone Potential Bulletin, and look at the Streamline Analysis, which shows winds for the tropics.